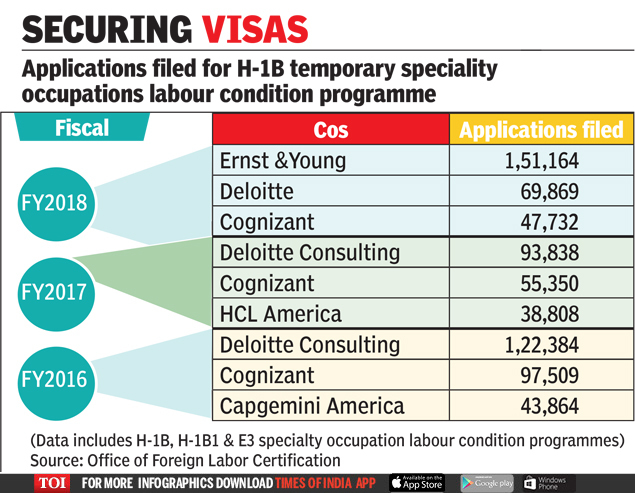 BENGALURU: Consulting, audit and tax advisory firms have topped the list of those applying for H-1B visas in the last five years. Ernst & Young filed the most in fiscal 2018, at 151,164. This was followed by Deloitte and Cognizant, which filed 69,869 and 47,732 respectively. In fiscal 2017, Deloitte Consulting and Cognizant filed the maximum number of applications. Collectively, Indian IT service companies have been big applicants for this US work visa. But their application numbers are dropping, with pressure on them to hire locally. The numbers provided are for what are called labour condition applications (LCAs). These are filed for new H-1Bs, renewal of H-1Bs and even for each location that an employee on H-1B would be working at. The numbers also include those for smaller programmes like the H-1B1, which allows employers to temporarily employ foreign workers from Chile and Singapore in specialty occupations, and the E-3 programme, which allows employers to temporarily employ foreign workers from Australia. The US Citizenship & Immigration Services (USCIS) provides for 65,000 H-1B visas a year in the general category and another 20,000 for those with advanced degrees. In fiscal 2018, the top positions for which LCAs were filed for included software developers, computer system analysts, accountants and auditors, computer programmers, and operational research analysts. California has the highest number of applications followed by Texas and New York. In total, companies filed for 626,907 applications, a 5.4 per cent increase over the previous year. “The statistics do not spring a surprise in terms of software development being the top occupation or California having the highest number of applications. Overall, a 5.4 per cent increase in the applications received from the previous year demonstrates the robust demand for specialists in technology and related sectors,” said Vikram Shroff, lead of HR law at law firm Nishith Desai Associates. Cyrus Mehta, managing attorney and founder of New York-based law firm Cyrus D Mehta & Partners, said LCAs are for new petitions and for renewals. “They can also include LCAs for amendments. Under current law, each time the job site changes, the employer in most circumstances has to obtain a new LCA and then file an amended H-1B petition,” he said. Mehta said a higher number of LCAs does not necessarily mean it has filed for more H-1B petitions. “It could be that they may be moving their H-1B workers very frequently, and so they need to obtain new LCAs to cover the different job locations that an H-1B worker will potentially be moved to during the validity period of the H-1B petition. You can have many LCAs for each H-1B petition,” he said.